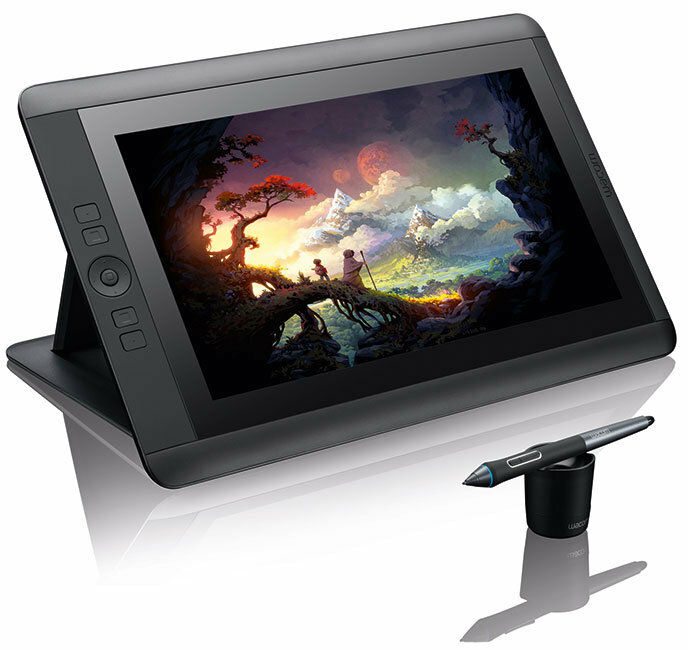 I’ve had my Wacom Cintiq 13hd for two months now and thought I should put down my thoughts of it here on the blog. First I will write a bit about my impressions of the hardware and then what it is like to work with. When I received my Cintiq on the post I was like child at Christmas, I’ve been dreaming of one since I knew they existed, but they’ve always been too expensive. When the 13hd arrived on the market there was suddenly one that was in a price span that I could afford. Of course there was the 12wx before but for some reason that one never felt like the real thing for me with its lower resolution. I wanted the real thing, and luckily enough the 13hd just looked like it would be that. Everything from the box to the actual Cintiq itself both felt and looked top notch, unpacking it was a nothing but a pleasure. All things are really of very high quality and I must say that I don’t really have anything to complain about when it comes to the hardware. Of course there are some small things they could have done better. The biggest thing that could need an improvement in the future is the actual connector to the Cintiq. In the package you get a cable that you connect to the Cintiq on one side, on the other side the cable splits up into three different cables, one for the USB, one Hdmi and one for electricity. This generally works very well but the connection to the Cintiq feels very fragile and I am always a bit worried that it will break by mistake. I’ve also read on the net that quite a lot of people have had problems with the connector that it will drop out while moving the Cintiq during work. I’ve had no problems with this at all. The connection works without a problem, but as I said the actual construction feels fragile. You also get a pen and some nibs with the Cintiq. They all come delivered in a very nice little box that has a nice magnetic kind of lock that gives a very expensive feeling. I usually keep my pen in it when I’m not working so I won’t lose it, and so that my kids don’t find it and starts to play with it. So how is it to draw with? I mainly use the Cintiq to make digital maps and map objects so that is what I will refer to during this review. Before I had the Cintiq I had a Wacom Bamboo. It worked fine but I always felt that I couldn’t get my full potential into the maps while using it. Or at least I had to work very hard to get the result I was after. The Cintiq changes all of that. It works like a charm and it really is like going back to draw on paper. When I use it I feel like I did when I made maps for my games I played while growing up. It just can’t get any better than this. When I first started up the Cintiq however I had some problems calibrating it. If I did calibrate it as supposed by Wacom, you do this by clicking in some crosses on the screen with the pen, the calibration didn’t work out for me. When I looked at the pen where it connected to the screen the pen and program didn’t connect in the same spot. I always drew some mm next to the pen. This was very annoying and didn’t make the experience very good. To solve it I just calibrated the pen by not clicking in the crosses, as you are supposed to, and in this way I succeeded in tricking the calibration so that the pen now is very precise. As you might understand from this short review I am very pleased with the Cintiq and I feel that I can improve my mapping skills a lot by using it, and also that I can work quicker with it. If you miss drawing on paper and want to skip the whole process of scanning your maps to make them digital I can highly recommend the Cintiq 13hd. This is a map I’ve made for the site erebaltor.se. It depicts the main city and capital in the country Jourdashur. It is a kind of fantasy Viking setting with much of the inspiration taken from old Nordic myths and history. The World Ereb Altor was originally created by the Swedish RPG company Äventyrsspel in the late 80’s and in the northern part of the world the Viking like country Jourdashur was placed. After something like ten years the development of the world stopped and in the end even the company Äventyrsspel seized to exist. And with that the story of Ereb Altor could have come to an end. But some years ago I discovered that some old gamers had started the site erebaltor.se where they continued to develop and explore the world. Since Ereb Altor had been the world where I started out as an adventurer when I started to play RPG’s I was really glad to discover that someone was still working on it. And when they asked me if I could help them out with some city maps I gladly accepted. It actually felt a bit like coming home. 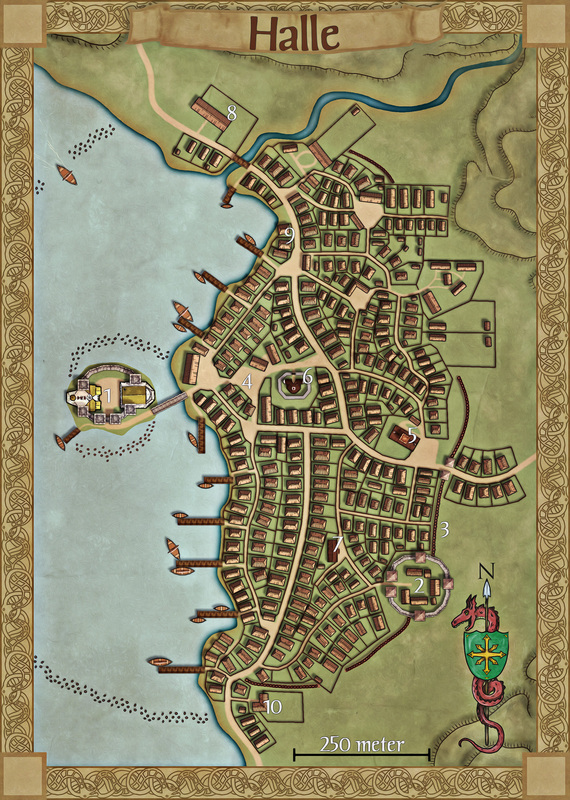 The map itself was made in both City designer 3 (CD3) from Profantasy and Photoshop. First I got a sketch of the map that gave me the overall layout of the place, I then started in CD3 by marking out the terrain and sea, put in all the roads and began on adding all the houses. One of the challenges with the map was that the city is surrounded by hills, and I’m not too fond of the default tools for making hills in CD3, so I decided to make those in Photoshop. When all houses and streets where done in CD3 I exported the map and opened it up in Photoshop. Now I added the hills, the palisade and the labelling. As always I also worked a bit with the colours of the map as I find the default colours in CD3 to be too bright. At last I created a new border where I got the inspiration from some old Viking patterns. I really like to create cities, they take a lot more time then making world maps, but they also give more back. I always try to see the town in front of me while mapping, trying to imagine what it would be like to walk down the streets or sailing in to the harbour after a long trip on the sea. Cities have always fascinated me and mapping them is great fun.